Click to enlarge Take the right front panel of the corset lining and place the hook half of the busk on the wrong side of the fabric. 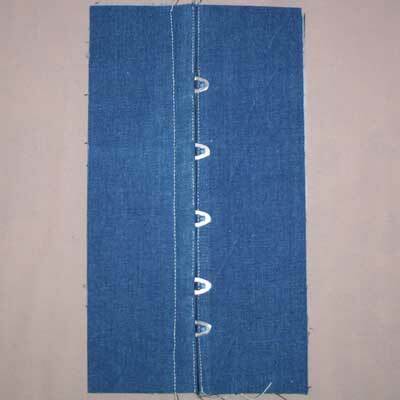 Click to enlarge Mark the stitching line leaving gaps where the hooks protrude from the corset. 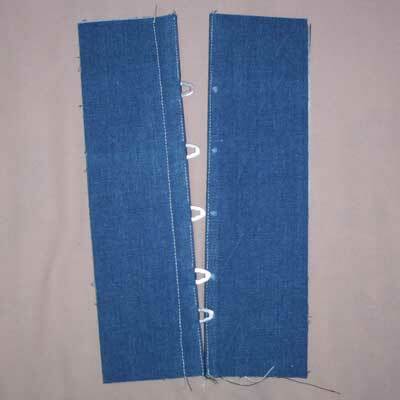 Click to enlarge Pin corset lining and fashion fabric with right sides together. 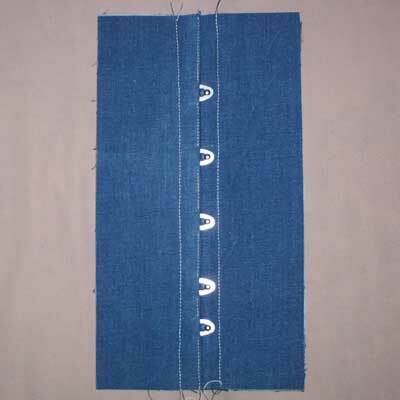 Stitch the centre front seam over the markings, backstitching at each opening ensuring not to stitch over the gaps. 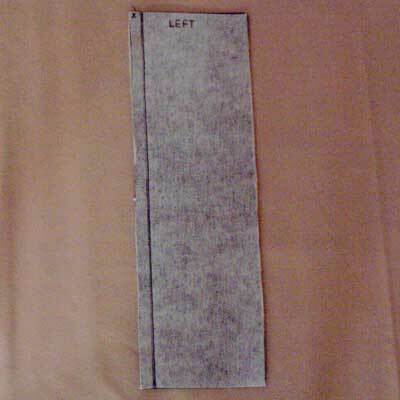 Turn right side around and press seam. Click to enlarge On right side of fashion fabric mark the gaps with pins or a dressmaker’s pencil and top stitch close to the edge making sure to keep the gaps open. Do not backstitch this time, but pull the thread ends to the inside (between fashion fabric and lining) and knot together. 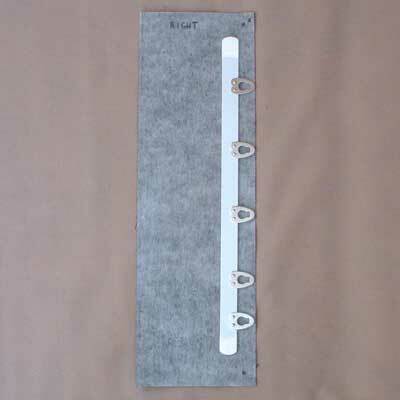 Insert hook side of busk into the panel and pin. Stitch in place using a zipper foot to get as close as possible to the busk. Click to enlarge Put the right front panel aside and take the left front panels of corset lining and fashion fabric and pin them with right sides together. 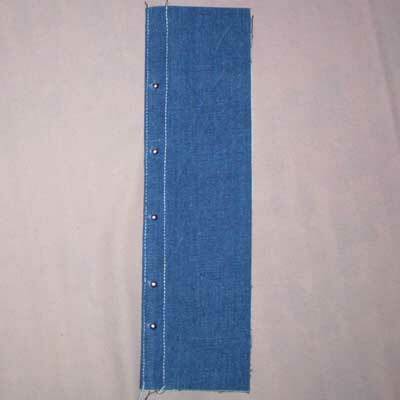 Stitch centre front seam. Turn right side around and press seam, then top stitch close to the edge. Click to enlarge Take the finished right front panel and line up with left front panel. With a dressmaker’s pencil, mark on the fashion fabric where the hooks overlap. 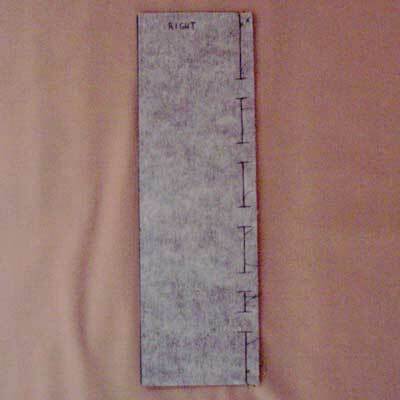 Click to enlarge< Using an awl, knitting needle or other pointed instrument, poke holes in each of the markings, making sure to only go through the fashion fabric. Make the holes big enough to just be able to squeeze the knobs through. 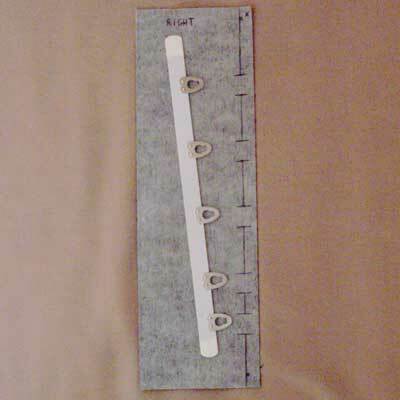 Click to enlarge Insert the knob half of the busk into the panel and through each of the holes. Stitch in place using a zipper foot to get as close as possible to the busk. Click to enlarge Busk insertion is complete! great! very helpful! pictures make this so much easier to understand! this is so helpful and i love how you have the pictures with! my corset busk came out amazing thanks to you! thanks so much for posting clear instruction with pictures to show what your talking about i have been searching for this on the net all morning your website is a great resource!!!!! You are my Goddess!!! Thank you so much for your website and your fabulous articles. My firends and I will be ordering from you lots! Wonderful! Thank you, i didn’t have a clue how to insert a busk. Now i can crack on and complete my sister’s corset. I am not sure about how and when to cut the openings for the busk hooks to go through the fabric and how are the openings finished so they will not ravel? It’s best not to cut the fabric for the busk hooks. 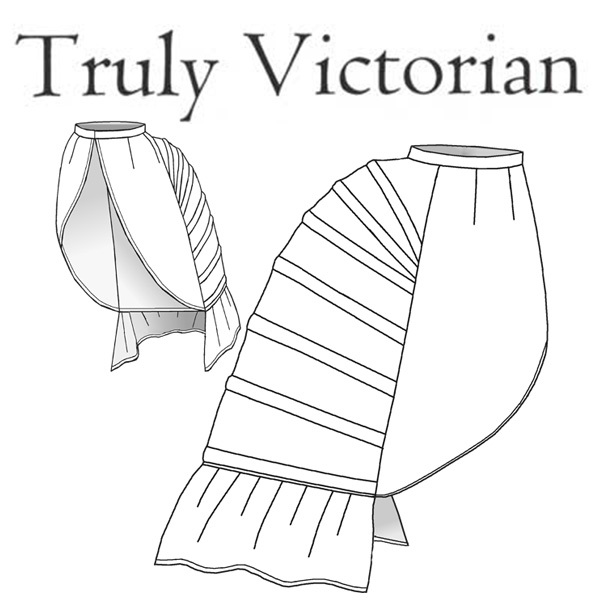 Use a pointed instrument such as an awl or knitting needle to poke a hole in the fabric. This will push the threads of the fabric aside but will not cut them. 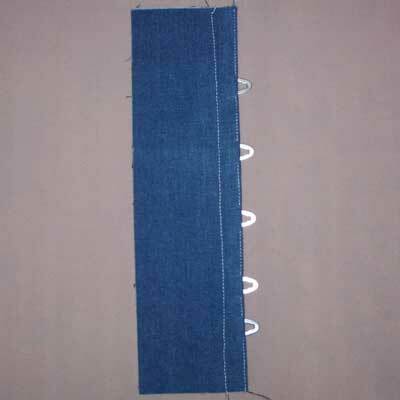 Then you can push the busk hooks through these holes and you don’t have to worry about the fabric unraveling. I agree, the info was exactly what I was looking for. Funny the big fancy websites do not take that extra step to show the busk hooks. Thank you so much for this great tutorial. I was completely lost on how to insert busks and this really helped me out a lot. Especially with the photo references. So thank you again. I am so glad to have these instructions and the pictures! I am a visual learner for the most part and need to see it to really grasp what needs to be done! I am going to try this for my next corset! My instructor at school recommended your sits and I am glad she did!